During the Reagan Administration, foreign language services at the Voice of America (VOA) were for the first time given in the 1980s significant freedom to originate their own news reports and to share them with VOA English programs. Some of these news reports and news backgrounders with audio actualities were also shared in English through the VOA central newsroom for translation and use by other foreign language services. Such cross-reporting was done occasionally before 1981, but it was much less common and not encouraged by central management. Programming reforms, which gave VOA language services more editorial freedom and a sharper anti-communist focus, were initially strongly resisted by a group of longtime senior managers until some of them were moved to less responsible positions. 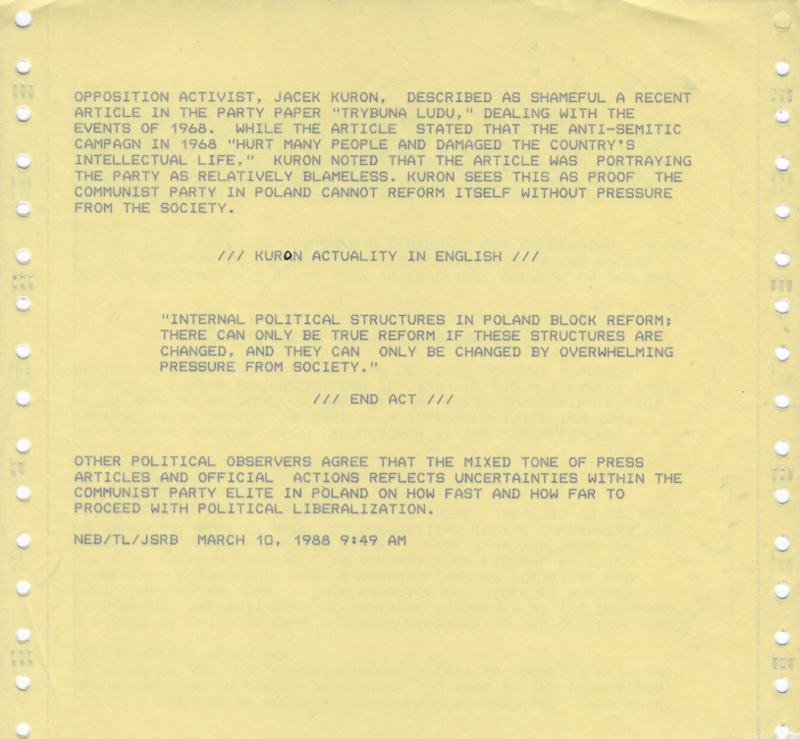 By 1988, when VOA Polish Service reported on anti-communist regime student demonstrations in Warsaw and Krakow, these personnel and programming reforms were well in place. There was also strong resistance to Reagan era changes from some of the central newsroom reporters, but in the end less radical than initially proposed but still significant programming and personnel reforms helped VOA language services to vastly increase their audience share and impact in East Central Europe. Many now believe that the radical transformation of VOA in the 1980s helped to advance the end of communist rule in the region. 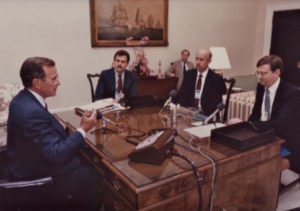 During the 1980s, VOA Polish Service was for the first time able to conduct numerous telephone interviews with opposition activists in Poland, including Solidarity leader Lech Wałęsa. He later became Poland’s President after the country shook off its submission to the Soviet Union and the communist party lost its decades-long monopoly on political power. VOA Polish Service also interviewed Solidarity trade union advisers, including Jacek Kuroń who later became Minister of Labor and Social Policy. Prior to 1981, VOA central newsroom would often have more detailed reports on what communist leaders were saying but frequently failed to counter fully and effectively their propaganda and disinformation. While in the 1980s, the Polish Service also interviewed communist officials from time to time, it was never done with the purpose of giving them equal time. VOA’s foreign language broadcasters understood that communist propagandists already had their own censored media to advance their misleading narratives. Interviews with regime apologists would be carefully balanced by reporting countervailing facts and including statements from opposition figures exposing any false claims of the Jaruzelski regime. Invariably, even these interviews would undermine the regime’s propaganda. The Voice of America news backgrounder, “Polish Demos,” written by VOA Polish Service chief Ted Lipien, was issued by VOA on March 10, 1988. It described the communist regime’s violent response to student demonstrations in Warsaw and Kraków as inconsistent with its own propaganda. INTRO: POLISH POLICE USED FORCE ON PROTESTERS IN WARSAW AND KRAKOW ON THE ANNIVERSARY OF THE STUDENT DEMONSTRATIONS TWENTY YEARS AGO. VOA’S TED LIPIEN SAYS IN THE VIEW OF OPPOSITION ACTIVISTS, THIS PROVES THE POLISH GOVERNMENT IS NOT SINCERE IN ITS CONDEMNATION OF THE CAMPAIGN OF POLICE BRUTALITY AND OFFICIAL ANTI-SEMITISM LAUNCHED IN 1968. VOICE: THE USE OF FORCE BY THE POLICE TO DISPERSE TUESDAY’S DEMONSTRATIONS IN WARSAW AND KRAKOW IS SEEN BY THE OPPOSITION AS PROOF OF THE GOVERNMENT’S INCONSISTENCY IN DEALING WITH THE EVENTS TWENTY YEARS AGO. A NUMBER OF ARTICLES HAVE APPEARED RECENTLY IN THE OFFICIAL PRESS CONDEMNING THE ANTI-SEMITIC CAMPAIGN LAUNGHED BY THE COMMUNIST PARTY LEADERS IN 1968. THIS CAMPAIGN WAS DIRECTED AGAINST STUDENTS AND INTELLECTUALS DEMANDING GREATER POLITICAL AND ARTISTIC FREEDOMS, AS WELL AS AGAINST MORE LIBERAL POLITICAL RIVALS WITHIN THE COMMUNIST PARTY. MORE THAN TEN THOUSAND POLISH JEWS, SOME OF WHOM HELD POSITIONS IN THE GOVERNMENT AND UNIVERSITIES, WERE FORCED TO GIVE UP THEIR JOBS AND TO EMIGRATE. DR. WIESLAW ZABLOCKI IS A RESEARCHER AT THE JAGIELLONIAN UNIVERSITY IN KRAKOW. 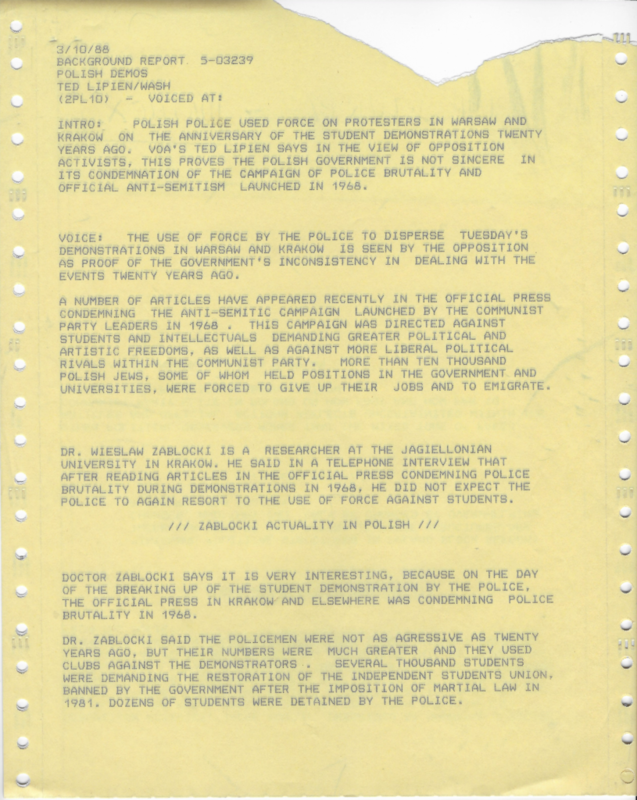 HE SAID IN A TELEPHONE INTERVIEW THAT AFTER READING ARTICLES IN THE OFFICIAL PRESS CONDEMNING POLICE BRUTALITY DURING DEMONSTRATIONS IN 1968, HE DID NOT EXPECT THE POLICE TO AGAIN RESORT TO THE USE OF FORCE AGAINST STUDENTS. DOCTOR ZABLOCKI SAYS IT IS VERY INTERESTING, BECAUSE ON THE DAY OF THE BREAKING UP OF THE STUDENT DEMONSTRATION BY THE POLICE, THE OFFICIAL PRESS IN KRAKOW AND ELSEWHERE WAS CONDEMNING POLICE BRUTALITY IN 1968. OPPOSITION ACTIVIST, JACEK KURON, DESCRIBED AS SHAMEFUL A RECENT ARTICLE IN THE PARTY PAPER “TRYBUNA LUDU,” DEALING WITH THE EVENTS OF 1968. WHILE THE ARTICLE STATED THAT THE ANTI-SEMITIC CAMPAIGN IN 1968 “HURT MANY PEOPLE AND DAMAGED THE COUNTRY’S INTELLECTUAL LIFE,” KURON NOTED THAT THE ARTICLE WAS PORTRAYING THE PARTY AS RELATIVELY BLAMELESS. KURON SEES THIS AS PROOF THE COMMUNIST PARTY IN POLAND CANNOT REFORM ITSELF WITHOUT PRESSURE FROM THE SOCIETY. OTHER POLITICAL OBSERVERS AGREE THAT THE MIXED TONE OF PRESS ARTICLES AND OFFICIAL ACTIONS REFLECTS UNCERTAINTIES WITHIN THE COMMUNIST PARTY ELITE IN POLAND ON HOW FAST AND HOW FAR TO PROCEED WITH POLITICAL LIBERALIZATION. Cover of a VOA Polish Service promotional flyer with a photo of Voice of America correspondent Wayne Corey and VOA Polish Service director Ted Lipien interviewing Vice President George H.W. Bush at the White House on September 24, 1987 shortly before his visit to Poland.